Double Elephant Print Workshop is a Community Interest Company and Social Enterprise. 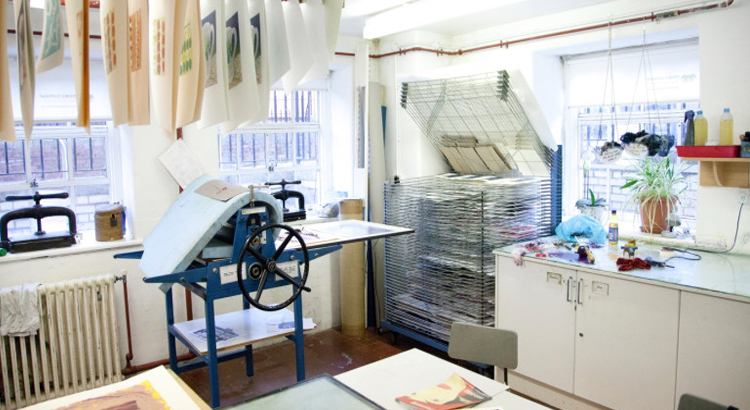 It was established as a not-for-profit, open-access printmaking resource in 1997 by Simon Ripley and Lynn Bailey. The name Double Elephant taken from the large Imperial paper size used in printmaking. Working from its Exeter city centre base, across Devon and beyond, Double Elephant Print Workshop offers courses, resources and support to professional printmakers, artists and beginners alike. Double Elephant currently has around 90 artist members from Devon, Cornwall, Dorset and Somerset. The workshop supports professional and semi professional artists as well as those new to printmaking. In addition Double Elephant works with groups of people normally excluded from mainstream arts activity, both on site at the premises and off-site through the portable workshop facilities. To find out more visit Double Elephant's website. For more demo videos visit Double Elephant's Vimeo.